The victims of a serious Lyft accident on Capitol Hill in Seattle have retained the Uber & Lyft accident attorneys at Davis Law Group to represent them in possible legal action accident against the at-fault driver who caused the December 2018 collision. 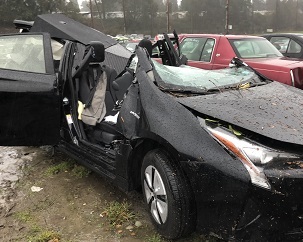 On December 28, 2018 at approximately 10:30 AM the Lyft vehicle, a 2018 Toyota Prius, was traveling on Belmont Avenue East near East Mercer Street in Seattle. At the same time the driver of a Chevy Impala was approaching the same intersection but failed to come to stop at a stop sign and t-boned the driver-side of the Lyft vehicle. This caused the Lyft car to swerve onto a curb, hit a stop sign, then crash into The Highlander condominium building. The Impala crashed into a nearby telephone pole. The driver of the Impala that failed to yield at the stop sign did not have a valid drivers license or proof of insurance. The Lyft vehicle contained the driver and three passenger. The driver was trapped and had to be cut out of the vehicle by first responders from the Seattle Fire Department using the jaws-of-life and then transported to Harborview Medical Center. The person in the Lyft vehicle that suffered the most serious injuries had damage to the neck, left hip, pelvis, knees, ribs, back, feet and head. CALL FOR WITNESSES: Attorney Chris Davis is asking that any persons who saw this incident or residents of The Highlander complex who may have come upon the scene after the crash; took photos/video; anyone who may have tried to offer assistance on the scene or who had any contact with any of the victims; or anyone who has any information about the accident to please call Davis Law Group at 206-727-4000. Office Hours: 24 hours/day. 7 days/week.